Wij hadden rolstoel nodig in onze vakantie. Gebeld en de volgende dag om 16.00 zoals afgesproken werd deze netjes bezorgd. Ook bij het afhalen stipt optijd. Erg goede service. Mocht u er 1 nodig hebbe..
SUPER FIRMA : SOL MOBILITY. Ik kan maar één ding zeggen, wacht niet!!! Huur je scooter op tijd , prijs kwaliteit zeer goed. Ze helpen je waar het kan. Als ik volgend jaar terug ga, huur ik zeker terug.. Fantastic service, very reliably equipment at a fair price. The staff were extremely helpful and accommodating from start to finish. ..
Would absolutely recommend Sol Mobility they have made our holiday so much easier. Used Sol Mobility as a very last minute, fantastic, professional and very helpful service. Thank you very much.. Excellent company, found them after having been let down badly by another company.....Sol Mobility first class from start to finish. Thank you! - BEST IN GRAN CANARIA! ..
Great Service, I got my flight times wrong so they left the wheel chair at the hotel for me so that I was not without and came back to sort paper work and money out the next day which out any issue. ..
Hatten drei Wochen einen Rollstuhl gemietet. Inklusive Transfer von Airport und zurück. Alles klappte ohne Probleme. Wir können es nur weiter empfehlen. ..
Sol Mobility was so helpful and the staff so nice. .. Fantastic service from Sol Mobility it really does change the whole aspect of our holiday. Being picked up at the airport and dropped back off, all the help we get. The scooter being delivered place a.. I would highly recommend Sol Mobility. Excellent service. Professional, extremely helpful and very kind. All equipment explained and in excellent working order. Very efficient. Delivery and collection.. Your service made our holiday absolutely awsome!! Thank you and see you next year :)..
We have used Sol mobility for our last 5 visits to Gran Canaria. Amazing company great friendly service, always simple to use and so so helpful. My mother uses the scooter and also the transport taxi..
Exzellenter Service und sehr nettes Personal.. Excellent Service,and very Friendly Staff.. I have Hired a Mobility Scooter for the past three Years from Sol Mobility, and have always received excellent service from all their Staff, they all Friendly and very Reliable. I would definitely re..
Used Sol Mobility team several times. Last time Nov 2017 and re-booking for next year in Gran Canaria. Thanks Sol Mobility! Jim.. 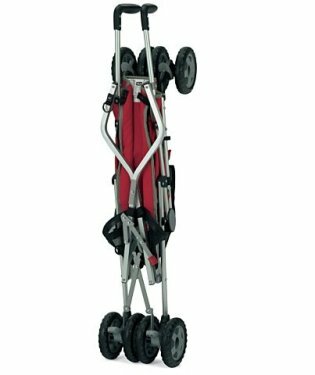 I hired a rollator for my mum on 24/12/17,great service and such a polite young man delivered it to our apartment.As this was Christmas Eve I was surprised and delighted to receive the rollator so pro.. The best in the island. They offers a good assistance and they are very cordial and available. The prices are excellent. Thanks Sol Mobility!.. Just want to say a huge thank you to the staff at Sol Mobility, we recently rented a portable AC unit on holidays in Puerto Rico. From the very start they were so helpful efficient and so reliable, an.. Hired 2 Grande Deluxe Scooters for my wife and me. Will do the same again when we return in the spring. Have done this several times on the Spanish Mainland and Islands and seldom been disappointed. H..
Fast, friendly and efficient service. Would certainly use again..
Neil and his employees are really friendly people and make you feel very comfortable when hiring a scooter as I did . The service was excellent and when I return I will be using them again. Highly rec..
Neil and his staff provided such an excellent service, we requested the equipment be available on our arrival at the Hotel, everything was in place in our Hotel Room, they are really customer focused .. Excellent service received from start to finish from this excellent caring company, a lovely prompt call back to the UK from Sandy, who had a lovely sunny personality, who met my needs and requiremen..
We will certainly use Sol Mobility again and would highly recommend them. Delivered and picked at times agreed, first class service. Contacted via email from UK, received a phone call, took all detail..
Quick fast reliable service, daughter loved the stroller, staff great and always helpfull..
Great service! Rented portable aircon. Very easy to contact them and they answer quickly. 100% service and such a nice guy delivered it. I recommend them and will do buisness with them again! ..
TOP SERVICE! Neil & Davie were BRILLIANT when my husband had an accident and Sol Mobility came to our rescue and solved all our problems. Thanks so much for getting our holiday back on track. Never ..
Toller Service und alles super Organisiert! Mit einem Vertrag und sogar Bring- und Abholservice :-) Auch die kurzfristige Anfrage war kein Problem. Vielen Danke für alles! Great service and organized..
Great service guys!!! 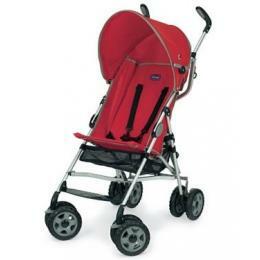 Excellent quality buggy for our toddler while in Gran Canaria, much appreciated. ���..
From the initial phone call to discuss our travel plans, I knew I was dealing with a professional company that takes its customer promise seriously. Our family includes granny with limited mobility an..
We have had a 5 star service from Sol Mobility. Rented a Wheelchair for our stay in Playa Del Ingles. The Wheelchair was delivered to our hotel within 30 minutes of requesting one. The Wheelchair was ..
What a fantastic service. Took my mum to Gran Canaria twice and used Sol Mobility twice and would use them every time we go. Such friendly staff especially Helen and Neil they were so helpful and noth..
Just waiting to leave the hotel and wanted to thank Sol Mobility so so much for their fantastic service! We hired an electric scooter and a shower chair, got to the hotel late at night and the scooter.. Hired an electric wheelchair at the end of March for 2 weeks and whilst our holiday went a bit wrong and we ended up at a different resort Helen made sure she got the chair to us in a very timely and ..
To Helen and everyone at Sol Mobility-I would just like to say a big 'thank you' to you and everyone involved in making my husband's recent holiday to Gran Canaria so 'hassle free'. Your service was ..
Got first class service from Helen and trainee Dave very helpful and professional. Will definitely use again. Also very reasonable price. Having the wheelchair made our holiday. Also had option to upg.. Excellent quality buggy rented while in Gran Canaria, Great Service, delivered and picked up from hotel....much appreciated guys, many thanks Dave & Lala..
Helen gave us a first class service. Very attentive and explained everything clearly. Very very pleased and will definitely use Sol Mobility again next year. Thank you for looking after us. Our holid..
Great service to help you decide the right product for you.Everything explained by friendly caring staff. first rate service. Thank you .. It is the best company ever! You will get all the help you need with full services. Just love you!!! ..
Exellent service! Strollers was brought to apartment door as agreed and they picked those up also so. Easy and simple! ..
Mobility scooter hire at a great price every time from fantastic people i recommend anyone going to Grand Canary to rent there mobility scooter with Sol mobility. Included a walking stick holder and e.. Brilliant service and excellent value for money! See you next time. Best regards Peter & Cath..
What a great experience to rent a stroller by you. Everything worked perfectly, both in terms of delivery at our hotel and pick up after our holiday. I can recommend all travelers to make use of thi.. Thanks for the good service and friendly staff with you. punctual and keep appointments. before my next trip I will call for and book barnevogn.lar pram at home and rent stroller is genius ..
We got a very good service from a nice lady, called Helen. She was flexible and both delivered and collected the stroller we rent by Sol Mobility at the hotel we lived at. Thank you very much! .. Thanks for this great and professional service. We could enjoy our holidays without stress with our own equipment. We hired a high chair and a lightweight deluxe stroller, which was perfect and easy t..
Great service!! Fast reliable reasonably priced deliver to wherever you're staying. Couldn't ask for better service!! Highly recommended ..
What a life saver many thanks for promptly delivering a wheelchair so my mum could enjoy her holidays!! Highly recommended!! Many thanks ..
Fantastisk service. Rullatoren hjalp min kone (og oss) til en fullverdig ferie. Levering og henting helt i henhold til avtale- nesten på sekundet. Kan varmt anbefales. Wonderful service. The equipme..
Great service today from your business. My husband loves his scooter. Great value for money too, will need to order again for next year when we come. Thank you Helen, great meeting you. ..
Would just like to say that I will definately recommend this company to anyone who is looking for a scooter while on holiday. After speaking with Helen, the same day a scooter was delivered to my aunt..
First class service. Would recommend sol mobility anytime. .. Excellent service from all at Sol Mobility. Very friendly, helpful and professional. .. Fantastic prices and service, I recommend Sol Mobility to all our clients travelling over on their holidays and everyone has been very happy at the quick response and friendliness of the staff. Recomm.. Hired a delux scooter for 2 weeks in october this is the second time i have used sol mobilatay great service i would be lost without them Helen and Neil i take my hat of to you .very helpful and frein.. Thanks to this company we have had a great vacation! We hired two car seats for our rental car and a deluxe stroller which was a real luxury! We enjoyed borrowing it for 11 days during our two week s.. Thanks to this company we have had a great vacation! We hired two car seats for our rental car and a deluxe stroller which was a real luxury! We enjoyed borrowing it for 11 days during our two week st..
Just want to say a great big THANK YOU to Neil & Helen for the amazing service you provided last week, scooter dropped off on time, been out more on this holiday far more and further afield than we ha..
On holiday here in Gran Canaria and broke my ankle in 2 places and fitted with a metal plate and 7 screws ... I wasn't able to walk ... I was stressing out about leaving the hospital but came across S..
Great service following an accident in Gran Canaria. Wheelchair delivered to the hotel within 40 mins of ringing and out of hours, cannot fault them. Thanks, made the rest of our holiday so much easie..
Anouk Spruytenburg Thanx Neil. The service was GREAT..... thanx for everything! So i could enjoy my holiday!!!!.. I hired a wheelchair for my holiday .The sevice was verry good. Thanks Neill That your'e service made it possible for me to do some sightseeing !! .. I'm a young, disabled woman and I wanted, no *needed*, some wheels so that I could venture out on my first holiday to Gran Canaria, in San Agustin. I've used scooters as part of shopmobility schemes a.. Hired s scooter in the last week of april i would have been lost without this service very good service great freindly people at Sol. Thank you again Helen .. I hired a four wheel mobility scooter and it was just fabulous, we did a few miles and it didn't even drop one bar of charge. I would definitely hire one again and the service was ace. Well done Sol M.. Thoroughly recommend Sol Mobility. We're just back yesterday from Puerto Anfi, Sol Mobility were perfect for us.! Equipment was great and the delivery / collection to ANFI was ideal. Helen from Sol Mo.. Happy to recommend this company (Sol Mobility). Up front, reliable and the equipment was top notch, I will definitely use their services again x .. Perfect to be able to rent a sturdy stroller instead of bringing it on the flight. Easy with delivery and pick-up at hotel. Everything as promised, on time, hassle-free by friendly staff. First contac.. Thanks Sol Mobility for saving my holiday when I broke my foot!! ..
We rented a baby stroller for a week. Everything went smoothly and service was very friendly! Thank you. I recommend. .. Thanks to you again to offer the possibility to rent a pram! It made our holiday very comfortable. We can highly recommend it! Helen was very friendly, in time and trustable. Thanks again. ..
A true life saver. Our baby stroller broke on the way to Gran Canaria. Rented one from Sol Mobility. Helen was so nice, helpful and service minded. I warmly recommend them! Never bringing a baby strol.. Thanks to Helen & Neil for a great service we got when hiring the baby stroller. Everything went extremely smoothly and will definitely come back again! .. Hired a wheelchair from Sol Mobility last week, and was very impressed with their service. Prompt reply to my enquiry - a well constructed and comfortable wheelchair - efficient delivery and collectio..
Super service and super prices. Love all the hard work by Helen & Neil to enable people with restricted mobility a full and enjoyable holiday .. Thanks for super service and great value for mobility scooter again this year Helen and Neil at duna beach maspalomas. Dad had super time. Couldn't holiday without your buggies. ..
Great service and top quality! The baby buggy made our stay very comfortable. Thank you, Neil and Helen, for your kind support! .. I hired one of these scooters in gran canaria just recently. Just like to say what an excellent service they give. .. Excellent friendly service carnt fault the service they provide droped off at hotel before we arrived came to collect money next day picked up before we left at a time that suited us thank you so much.. I have to say it was grate to have some one like sol mobility for people that needs to be able to get around i would not have manage with ..
Couldn't recommend this company enough!! So efficient, helpful and friendly. Being able to hire this scooter for my mother-in-law really made our holiday! A big thumbs up to Neil who is a super guy. T.. I would just like to say a big thank you to Neil and Helen for all their help when my mum and I needed wheelchairs in Gran Canneriea they was so helpful. We would highly recommend them. Thank you ..
Easy rental whilst on our holiday, it was a great price and it was awesome being able to use the manual wheelchair for traveling into Las Palmas for the day. Thank you guys!! .. 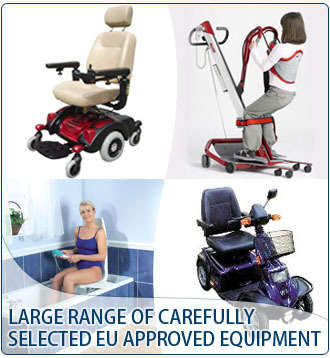 The Best Choice for mobility equipment! .. Friendly and professional service. 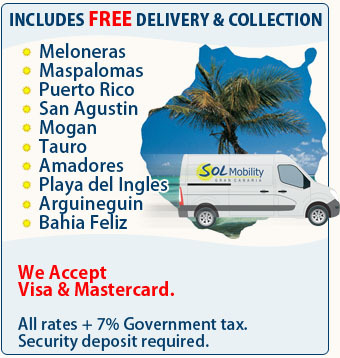 Would recommend Sol Mobility to anyone visiting Gran Canaria. Would not hesitate to use them again. We hired a pram and it was delivered to our hotel 20 mins after w..
Ages 6 months to 21/2 years. Sol Mobility reserves the right to change or alter the specification of the equipment supplied without prior notice and cannot guarantee availability of equipment. The information given here is for general consumption and does not form any part of a binding contract or agreement on the part of Sol Mobility S.L. No liability is accepted for the information on this website. Like us on Facebook and keep up to date with Sol Mobility News & Events in Gran Canaria.